Lady Anandamayi Ma was a high priestess in Atlantis, who came from the Temple of Divine Mother. She had high gifts of awareness to help people align into their self-Love. She taught people how to come into their own personal relationship with themselves. Her power enabled her to see and heal, removing conflict from the body and to bring forth self-Love. In her recent incarnation in India (1896-1982), Anandamayi Ma was considered spiritually illuminated from birth that travelled the length and breadth of India with few belongings. She went where she was needed with her practical teachings of how to discover the Divine Presence in everyday life. All those who pray and tune into her will receive her teachings and guidance and the Divine Mother presence that she holds. She will help you action a relationship of Love with yourself and others, connected to the divine qualities of the divine feminine sacred geometry of the flower of life. 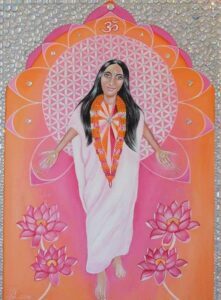 In the painting, Lady Anandamayi Ma comes through the gateway with the wisdom of divine mother, holding grace with her open arms to receive her loving guidance. She offers you her openness, like the Lotus Flower, connecting you to the flower of life within yourself. Her portal painting will help you discover your relationship and words of kindness and Love within you for ever more.